In 1993 Terry Oleson, PhD, and William Flocco published a study in the Journal of Obstetrics and Gynecology [Obstetrics and Gynecology, 1993;82(6): 906-11] titled “Randomized Controlled Study Of Premenstrual Symptoms Treated with Ear, Hand, and Foot Reflexology.” The participants that received the Foot Hand Ear Reflexology reported a 46% decrease in symptoms while only 19% of the placebo group reported a decrease in symptoms. In 2002 the Department of Nursing at Sun Cheon Cheong Am College in Korea did a study [J Women Health Nurs. 2002 Jun;8(2):212-221] where participants were given one hour foot reflexology sessions, six times in 60 days. A mean score before the reflexology was 8.35. After the course of reflexology it dropped to a 4.16 score at the first menstruation and then to 3.25 at the second menstruation. From 2 to 10 percent of women of reproductive age have severe distress and dysfunction caused by premenstrual dysphoric disorder, a severe form of premenstrual syndrome. 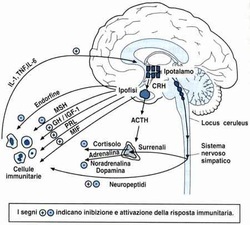 Current research implicates mechanisms of serotonin as relevant to etiology and treatment. Patients with mild to moderate symptoms of premenstrual syndrome may benefit from nonpharmacologic interventions such as education about the disorder, complementary therapies, lifestyle changes, and nutritional adjustments. 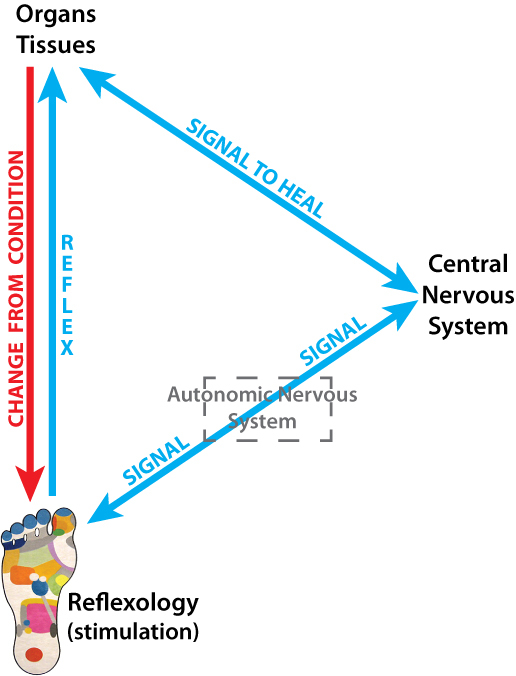 The graphic suggests how reflexology may "interfere" in the chain: Central Nervous System - Organs - Autonomic Nervous System. Further studies and researches have to test the other systemic relations and potential effects. According to some studies and researches, reflexology and acupressure (mainly at feet) may improve the blood circulation.